The center of BOXmover GmbH are you as the customer. Future-oriented developments in the field of transport logistics provide you with innovative ideas. Dipl-Ing. 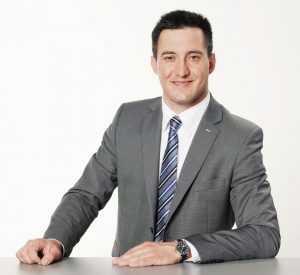 Rudolf Hubauer, managing partner and innovative spirit of BOXmover GmbH, acquired his extensive knowledge in the field of handling and storage technology at the HTL for mechanical engineering in Linz as well as at the Vienna University of Technology in the course of his studies “Industrial Engineering / Construction Management”. As part of numerous logistics research projects and more than 10 years of practical experience in innovative vehicle construction, including the company Scheuwimmer Fahrzeugbau GmbH, a broad base of knowledge has been created. During his studies he already developed an innovative, patented heavy duty high rack storage system, which resulted in a very successful cooperation with the MCE VOEST. led to the founding of BOXmover GmbH in 2004 with headquarters in Upper Austria. The basic engineering phase was successfully completed after a few years. The patent application was enabled by consistent further development, the rethinking of common solutions, as well as by the reduction to the essential technological and physical properties of cranes. 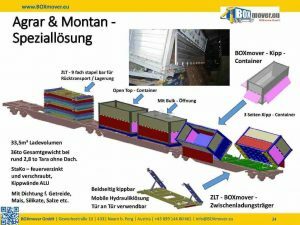 In 2009, a prototype of the BOXmover Seitenladers was completed. The relaunch of the BOXmover side loader technology in 2017 and the implementation of standardized hydraulic and electrical components guarantee a worldwide, largely maintenance-free operation. The manufacturing method of the sheet-metal-welded steel components has been further optimized so that in case of damage these components can be manufactured and installed on site at the regional distributor. Thus, BOXmover GmbH eliminates cost-intensive spare parts trading. Due to increasing customer requirements in the area of ​​combined freight traffic and the requirements to shift inland transport to the railways economically, the development spirit of Dipl.-Ing. Rudolf Hubauer awakened. BOXmover tipping containers as well as the BOXmover tipping unit. 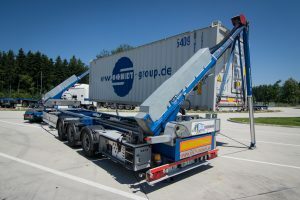 The development of a BOXmover roll-off container with the properties of an ISO container offers unimagined application possibilities, especially in the urban area. This symbiosis combines the best of two worlds of logistics. From the harvest field to the waste logistics industry, the BOXmover roll-off container offers the opportunity to be handled both with standard hook lift systems and with terminal equipment. BOXmover customers have no limits, they can operate worldwide and use the standards of international container transport. In addition, BOXmover GmbH has been an established partner in numerous innovative research projects in Austria for many years. Benefit from the BOXmover innovation spirit and the BOXmover Technologies! Change your logistics system with the help of BOXmover GmbH and become an innovative BOXmover!